I thought I'd write something about what it feels like to be at the mercy of the environment. So often in this day and age, people forget what it's really like to lose control. It's ever so easy to feel unimportant once you're out in the wilds. I find this sad, because it's the wilds where I feel most at home, it's the core from where we've come from. Yet it's somewhere if slightly messed with, it can kill you. Easily. Ellie and I were 2/3rds of our way through our most exciting adventure yet. It was 2011. We'd been in the Arctic of Svalbard over a month by this point, and were really starting to understand what how to live out there. It takes a lot of discipline, managing yourselves and looking out for one another. The people you sleep next to are the ones that you must be willing to risk your life for. Ellie and I were on our way to what was called the 'goose hide.' This was an already set up tent in a specific position to count various kinds of geese. It was all part of the ongoing science our group were doing out in Svalbard. Now it was our time to leave the safety of our fellow team mates and fend for ourselves and get on with the science. We were excited to be independent. I love Ellie to pieces and we both work so well as a duo. This was a great excuse to put our skills to the test and have a little peace and quiet at the same time. Svalbard is a beautiful place. I honestly think it's the most beautiful place I have ever set foot. Every day spent there was pristine beauty. This day was no different. 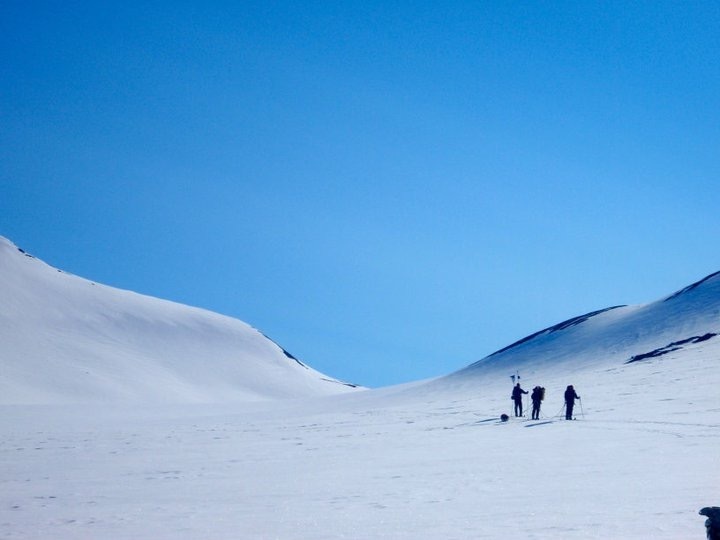 We left base camp with our skis on and headed north following a compass bearing. Despite leaving base camp for a couple days, our packs weren't light. Arctic travel involves enormous amounts of kit and food for one to even have the remote chance of surviving. Ellie and I were used to pulling heavy pulks and carrying heavy loads by now, so this was no biggy. Our bodies were so much fitter than when we'd left Heathrow. We had both become very petite but still incredibly physically and mentally fit. The fittest we had ever been. I'd lost my bum (completely) and even the tightest of my clothes would hang off me yet Ellie's thighs had increased in muscle so much that she was excited to test them out when she got home to dance on them again. Ellie also developed an incredibly fetching sunglasses tan! 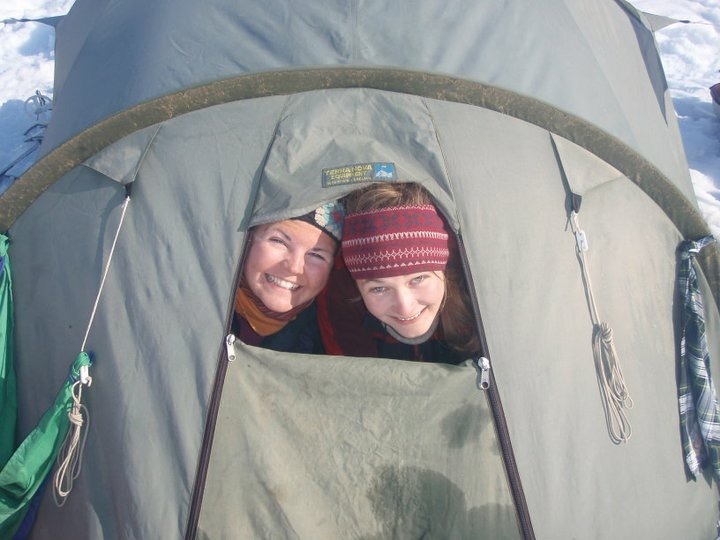 We were skiing uphill, laughing and joking about how funny it was that here we were, two 18 year old girls, alone in the Arctic. We were proud of ourselves and our compliments bounced off one another giving us this overwhelming sense of achievement and positivity for the future. "We can do anything we want to do" we told one another. It was true, it is true and not just for us, for everyone. It was that moment that we both stopped simultaneously. We both looked to the ground, then looked at one another, then back at the ground. It was a print. A huge animal print. We'd seen these before when with the team, yet this was fresh, this print had been made very recently. It was, of course, a polar bear print. It's claws were easy to make out as it had lifted its paw off the snow and taken another pounding step. The prints went up the hill, right in the direction that we were headed. Action stations. Ellie took the rifle from my backpack and handed it to me whilst I reached into my front pocket to get my bear flare. Ellie retrieved hers too. A bear flare is the size of a pen. All of our team carried one. If the back of the pen is pulled out, it fires a small flare at your target. It is a deterrent more than anything. We kept our cool. This wasn't a time to freak out, it was us that were responsible here. We skied past a point where the bear had obviously laid down and possibly rolled about, I think I even remember there being hair stuck on the snow. Finally, we got to the top of the hill, no bear. Thank goodness. We could see the tent for the goose hide but this didn't mean we were safe. Our brilliant team work and trust for one another came into use as we swiftly set up the bear flare trip wires, then the comms (wires set up in the right direction towards base camp so that we could make radio contact later on that night). Finally it was just the loo to dig out and jump into the tent. I had cleaned the gun before we had left so we didn't risk taking that apart that night! It was obvious we had to have a bear watch check throughout our stay. We would take it in turns to look out the tent at night to check there was no bears checking us out. Luckily Svalbard's 24 hour day light presents itself to this and makes things a lot easier. We got down to counting the geese and recording what we had found although geese weren't really at the forefront of our minds! It wasn't until 8pm that we could make contact with the others as that's when we all switch our radios on. We decided that we should let them know about our print encounter, even though we knew it would cause worry. It was my job to inform them. "On the way up to the goose hide, we saw, what we suspect to be very fresh polar bear prints." Silence. I looked at Ellie, she looked at me. We smiled nervously as this whole scenario seemed a tad bizarre. "Are you happy to continue? Over." Ellie prompted me to say that we were "as happy as larry". The others trusted us, and that was that. The radio was off. The night went by and nothing out of the ordinary happened. We had breakfast and headed off. We were fine and our respect, friendship and proudness (that's not a word) for one another increased even more. As we left the goose hide, a herd of reindeer moved in to the area we'd been. It was a beautiful sight. We both found out on our return that when our group leader, Neale, had heard of our findings on the radio, he had headed out from his tent immediately and kept watch from on top of the hill. What a guy. Polar bears are the masters there, not us. If it had been around and fancied a quick snack, then we would have had little control in the end. This was reinforced further when we had just all returned home and on the news reports of the tragedy that was the death of 17 year old Horatio Chapple, who was plucked from his tent by a starving polar bear. It's all too real when you're out in the wilds. Respect of the environment makes risks smaller. Respecting it means you understand the dangers and will not fight it but instead try to go with what it throws at you. Polar bears are dangerous but as we all know, we are the biggest threat to them with our pollution. I won't even get into how angry all of that makes me. There's a lot to be said that it was just us at that moment. If we had been in a bigger group, perhaps we wouldn't have taken on the responsibility to take action and protect everyone's lives. The fact we had no choice made us stronger as individuals and confident in ourselves to a point where whatever life throws at us, we can keep our cool and do what needs to be done.